Winter is here! While some of us don’t mind fattening up, others are trying to start the new year on a healthy note. Now, I know salads are more of a summer thing, but we’ve got so many delicious seasonal vegetables: we need to give them some love! For this recipe, I chose my favourite roots and greens to create this hearty healthy meal: brussels sprouts, carrots, beets and spinach. Once tossed with this tangy and sweet RISE Kombucha vinaigrette, you won’t eat a boring salad ever again! 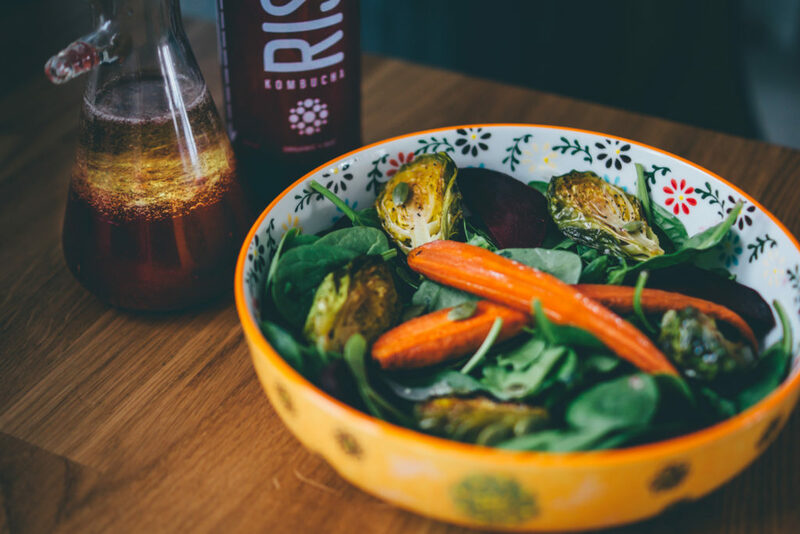 For the vinaigrette, any RISE kombucha will do. I chose the Hibicus & Rose Hips simply for the vibrant colour. Drizzle on your salad and enjoy it with any other veggies and toppings. This is your chance to play with vegetables you don’t usually eat, add nuts or seeds for crunch, add fruits for sweetness… let this vinaigrette stimulate your imagination and create your salad to get through this winter!